W. L. (Bill) Fourney is currently Keystone Professor and Associate Dean of Engineering at the University of Maryland. He holds a joint appointment in the Mechanical Engineering Department and the Aerospace Engineering Department. He received his BS in Aerospace Engineering and his MS in Theoretical and Applied Mechanics from West Virginia University. His PhD in Theoretical and Applied Mechanics was received from the University of Illinois in 1966. His areas of research interest are in experimental mechanics and fracture mechanics - primarily from a dynamic aspect. He has published approximately 220 articles describing the results of his research in dynamic fracture and crack arrest including approximately 50 reports to the sponsors of his research. His research has been sponsored by NSF, AFOSR, ONR, NRC, DOE, NSWC, ARL, Oak Ridge National Labs, Los Alamos National Labs, and the US Bureau of Mines. 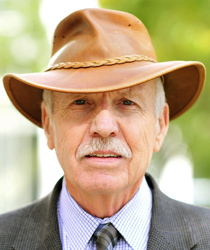 He has served as a consultant for Gillett Research Labs, Versar, Allegheny Ballistics Lab, Harry Diamond Labs, Los Alamos National Labs, and SAIC. He is active in the Society for Experimental Mechanics (SEM) and the International Society for Explosives Engineering (ISEE). In SEM he has been elected to fellow grade membership. Within ASTM he served as Chairman of the Crack Arrest Technical Committee. Within ISRM he was President of the Commission of Fragmentation by Blasting and is North American Editor of FRAGBLAST (International Journal on Fragmentation and Blasting). Recently the group that he chairs has switched affiliations from ISRM to ISEE. The name of that group is the Committee of Fragmentation by Blasting and is a Section within ISEE. He is also a member of the American Society for Testing Materials (ASTM), the American Society for Mechanical Engineers (ASME), the American Society for Engineering Education (ASEE), the American Society for Aeronautics and Astronautics AIAA), and the American Helicopter Society (AHS). SEM 2000 Tatnall Award “Long & Dedicated Service to SEM”. West Virginia University, Member Advisory Committee - Mechanical and Aerospace Engineering Department. Sixty-nine Clark School students were acknowledged for their contributions and accomplishments. Clark School students make a commitment to integrity and responsibility in the engineering profession. Mechanical Engineering senior Corey Abrams to deliver student speech. Keystone Professor William Fourney Receives SEM C.E. (Chuck) Taylor Award. Mechanical Engineering Professor Jaydev Desai named ASME Fellow. Department of Mechanical Engineering faculty celebrate the service of Professor Donald Barker at annual emeritus luncheon. Keystone professors such as Mel Gomez help Clark School students stay the course. Award recognizes Mtech founding director's extraordinary contributions to campus. Engineering interns from Mannheim, Germany enjoy UMD experience. Associate dean appointed to head newly formed office. Article on student retention programs cites successes of Clark School's Keystone program. Aris and Marianne Mardirossian Endowed Scholarship in Mechanical Engineering & Fourney Scholarship Endowment an Investment in Future Engineers. Levenson, working with William Fourney, developed a Micarta Fiberglass door. Four members of the Mechanical Engineering faculty are recipients of the Department of Defense MURI and DURIP awards.